Enigmas and awe is at the heart of the Halo story, says its new custodians, 343 Industries. The Halo games are famously the work of developer Bungie, but the studio released its last Halo game, Halo: Reach, last year, and has now handed the reins of the series over to 343 Industries. 343's franchise development director Frank O'Connor, who previously worked for Bungie on Halo 2 and 3, says that 343 plans to build on Bungie's work, and create new epic stories for fans to enjoy. O'Connor said that 343's mandate was the support and maintenance of the Halo franchise. 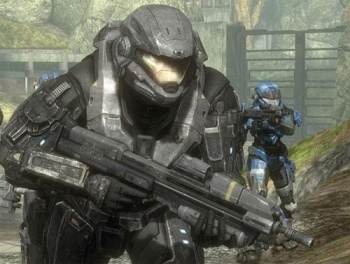 That included a variety of tasks, like publishing titles and supporting DLC, but O'Connor said the sky was the limit as far as 343's involvement with the series ran. He thought that mystery and awe were integral parts of the Halo universe. That meant that while 343 would be answering a lot of the questions that fans had asked over Halo's ten-year history, it would also be posing a lot of new questions to replace them. O'Connor indicated that there wasn't going to be any new adventures for Master Chief this year, nor were there any side stories or prequels like Reach or ODST in the works - at least, not in game form. It was a different matter when it came to books however, as 2011 would see the release of the first in series of books by veteran sci-fi writer Greg Bear, which would explore the Forerunner universe. There would also be more information about the more "contemporary" Halo novels by Karen Traviss, who - among other projects - worked on the story for Gears of War 3. Taking responsibility for Halo is a pretty mammoth task, but as O'Connor notes, many of the staff at 343 have worked on Halo games before, so the transition won't be as rough as it could have been. There's a lot of Halo content coming out - besides the novels, there are map packs for Reach to come - but it looks like it's going to be a while before we get to see what 343 itself will do with the series.